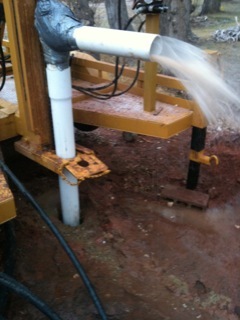 Water Well development is important once you finish drilling a water well. I will cover a little, but for the full story please check out our water well drilling and trouble shooting book. Once the water well is drilled and well casing and screen is set, then it is time to developed the water well. First thing is to get thick dirty drilling mud out and let new water flush out drilling mud and open the formation to let more water in. There are a few ways to do this. I will give you one example. First put a T PVC pipe fitting on top of well casing. DO NOT GLUE IT ON! If you want you may use screws and battery drill gun to fasten it on so air psi does not blow it off later. Once the PVC pipe T is in place, then get enough black Polly pipe to go to bottom of water well casing, then raise it up enough so that the black ploy pipe can blow air without restriction ( 1 or 2 feet off the bottom of water well). Where the ploy pipe enters the T PVC fitting at the top, wrap wet rags around PVC pipe and Polly to seal off top. Then on the side outlet of T PVC fitting add 2 to 4 ft of PVC pipe so water flushed out does not run down the side of the new casing and back in water well. The objective is to get old muddy water out, not circulate it. SAFETY TIP: DO NOT USE FULL PSI AT FIRST! If you do you can blow casing out and in the tree tops, not to mention give the guy holding the wet rags around the T fitting a 300 psi shower. First open air valve vary slowly taking 2 to 4 minutes gradually increasing air psi flow until your wide open. Once the water well has the main portion of dirty/muddy water blown out and air flow is full, the water well should be cycling and start making water. Once all the dirty/muddy water in bore hole/water well is blown out, then any other water coming out is what the well is producing. For more detailed info, please get our drilling troubleshooting book. Larger well casings take more air cfm to blow, smaller well casings 2 to 4 inch take less.